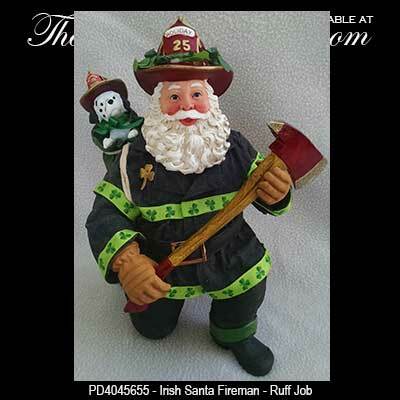 This Irish Santa firefighter decoration features shamrocks along with an ax and a puppy. Sorry this Irish Santa is now sold out for the season. 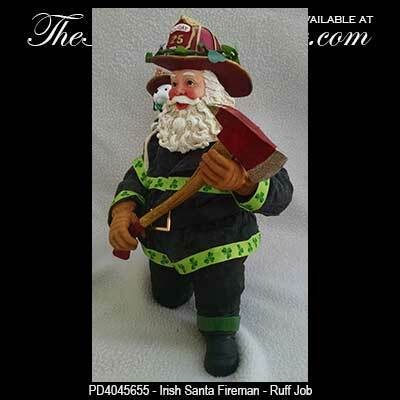 The Ruff Job Irish Santa fireman figurine is from Possible Dreams and he features shamrock reflector strips along with a gold shamrock on his coat and shamrocks on his helmet. 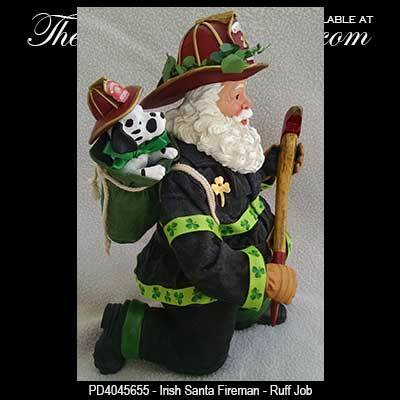 The Irish fireman Santa carries an ax with a real wood handle and a Dalmatian puppy in this sack. The Irish Santa decoration is made of porcelain and clothique©, and he measures 6.5" x 6 1/2 x 9.5” tall, with weighted legs and feet to keep him stable. The Christmas decoration is gift boxed with a shamrock history card that is complements of The Irish Gift House.